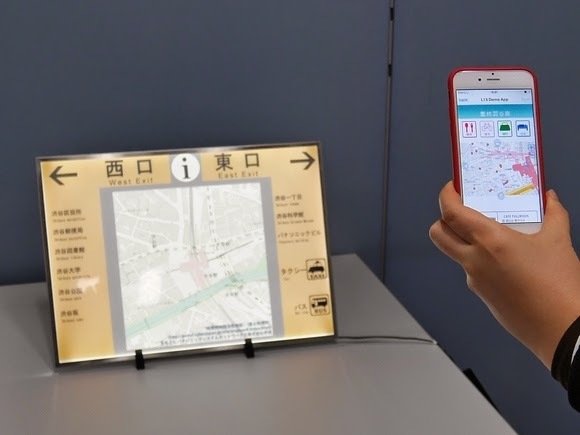 Nikkei Tech, PCWorld: Panasonic presents Hikari ID technology based on ID signals transmitted by backlighting LEDs of LCD signs. The LEDs flicker at a rate that is imperceptible to the human eye, but picked up by smartphone camera sensors from up to 5m away. The transmission speed is said to be several kilobits per second, according to Panasonic, significantly faster than conventional speeds for visible light communication (VLC). Panasonic plans to commercialize a device that transmits an ID from a light source in fiscal 2015. PCWorld: Fujitsu presented a similar illumination-based LED technology, but with a slower speed of 10bps. Fujitsu too aims to commercialize it during its fiscal 2015. The effort to properly frame the 'QR Code Image' and time to acquire a QR Code does not make this new "VLC" sound promising. Everyone must bunch up around a Sign and take a Photo to get Information that could not be contained within the Image that you are already viewing. Bluetooth operates at twice the distance, and WiFi would make more sense for Automotive (or fast walking) Receivers. I like new Tech., and promote it, I just hope this leads somewhere better.